12 April 2011 marks the 50th anniversary of the first human to orbit the Earth. Yuri Gagarin orbited the Earth on 12 April 1961. 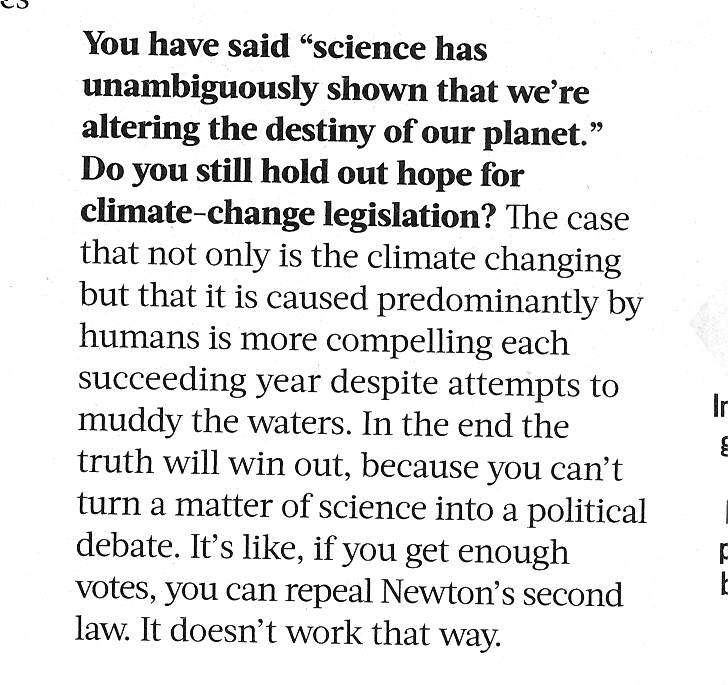 Chu Get educated about YOUR planet! You and your children (and on and on) will most likely be living here. How asteroids are found If you look carefully at this image (and it "plays" correctly on your computer) you will see a little dot of light appear to move in this 4-frame "movie". The dot is an asteroid, a chunk of rock or metal in space, most likely (but not always) located between Mars and Jupiter. Since the asteroids are very nearby (compared to the background stars!) and are moving around the Sun, they appear to move relative to the stars over even a short period of a few minutes. All of the "white dots" on this image (except for the moving one) are stars at various distances from us. This is an image of a very small section of the sky, taken with a moderately large telescope. (1) Asteroids out to Jupiter solar system / How many asteriods? (2) Asteroids inside main belt "Snapshot" of the positions of several thousand asteroids at some particular time. Most asteroids lie in the donut shaped area (where each asteroid is marked by a white dot) called the main asteroid belt. The two groups of asteroids 60 degrees on either side of Jupiter (green dots) are called the Trojan asteroids and are associated with Jupiter. The second image is a snapshot of the positions of asteroids inside the asteroid belt. This emphasizes the asteroids that may come close to the Earth. The 4 ellipses are the orbits of Mercury (noticebly "out of round") Venus, Earth and Mars. Now it looks like there are lots of asteroids near the Earth (and there are!) but the sizes of the asteroids are small compared to the distances between them. Thus, collisions of asteroids with the Earth are rare- at least collisions with big asteroids. BUT, as I talked about earlier, such collisions DO happen. How many asteroids are there? 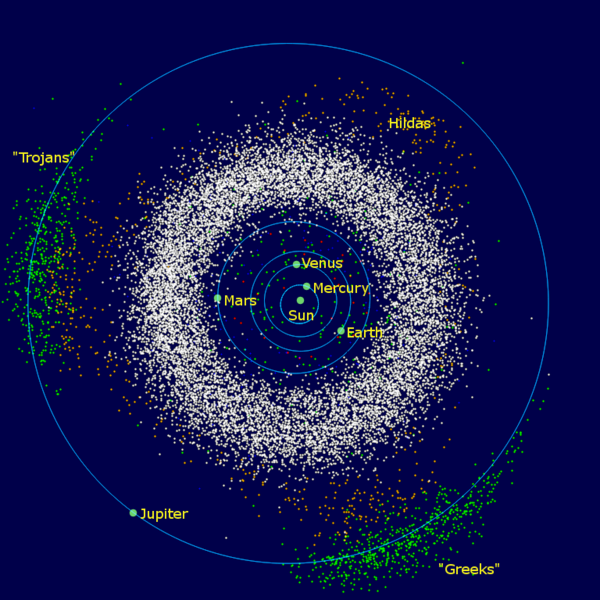 The "official tracker of the asteroids" is the Minor Planet Center http://www.cfa.harvard.edu/iau/mpc.html. Astronomers around the world report observations (position on sky and time of observation) of moving objects to the MPC. The MPC first checks if the object is already known. If not, it is given a provisional designation (e.g. 2008 TC3), where the letters are related to when the object was discovered. After enough observations have been made that an object has a good orbit (typically dozens of observations over several years) the object is given a number. As of August 2010, there are almost 250,000 numbered asteroids. About 290,000 asteroids have provisional designations but not yet a number. About 16,000 of the numbered asteroids also have a name. The latest estimate is that there are about 2 million main belt asteroids larger than 1 km in size. New surveys should be able to see all these 2 million, plus millions of somewhat smaller rocks, so that the number of known asteroids will almost certainly exceed a number of millions in the next decade as the new sky surveys get cranked up. Asteroid designations When a new asteroid is discovered, it is given a provisional code indicating when it was found. If the asteroid is then observed long enough for a good orbit to be determined, the asteroid is given a number. Some numbered asteroids are also given names. 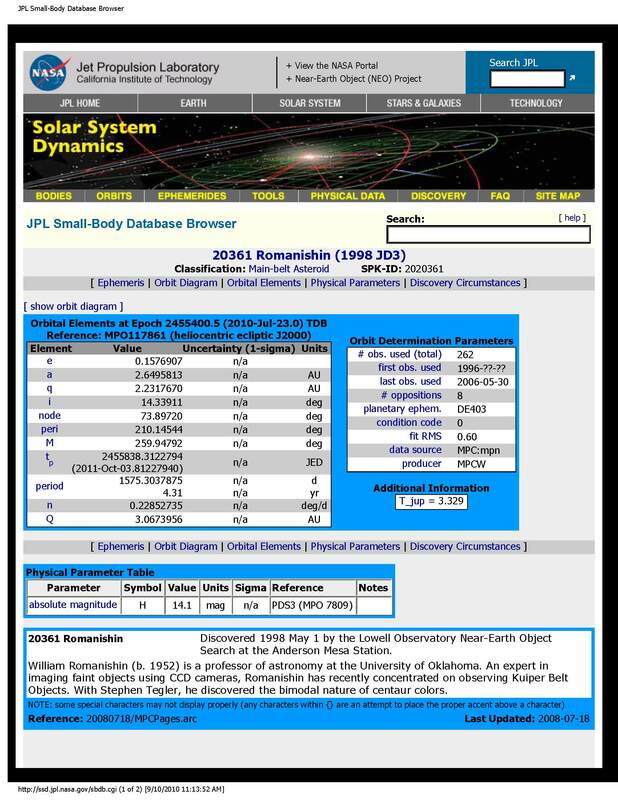 Here is page from official asteroid website with basic info on my favorite asteroid. It was discovered in 1998 at Lowell Observatory, and given provisional designation 1998 JD3. It was later given number 20361 (the 20361st asteroid given a number) and later given the name "Romanishin". 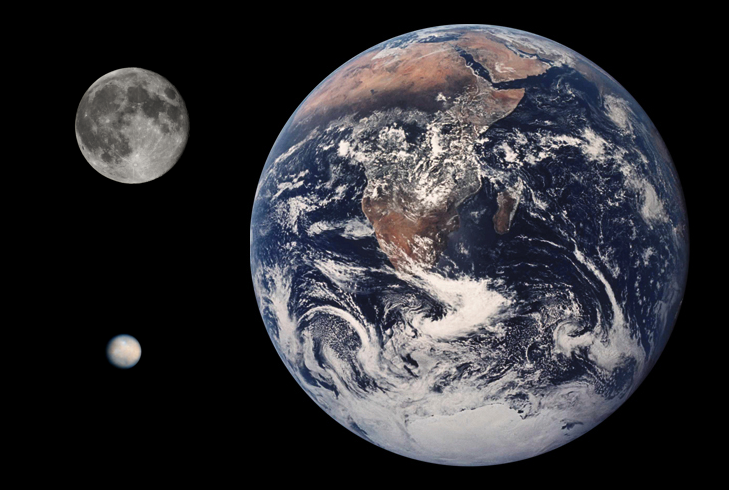 Earth, Moon and Ceres to scale and sizes of asteroids The largest asteroid (now called a dwarf planet) is Ceres. It is about as big as the state of Texas. Asteroid sizes range down from there to rocks and pebbles. Asteroid closeups and some general properties (1) (253) Mathtilde (2) (21) Lutetia (3) (243) Ida and Dactyl Most asteroids are still only unresolved (no detail visible) dots of light to our telescopes. 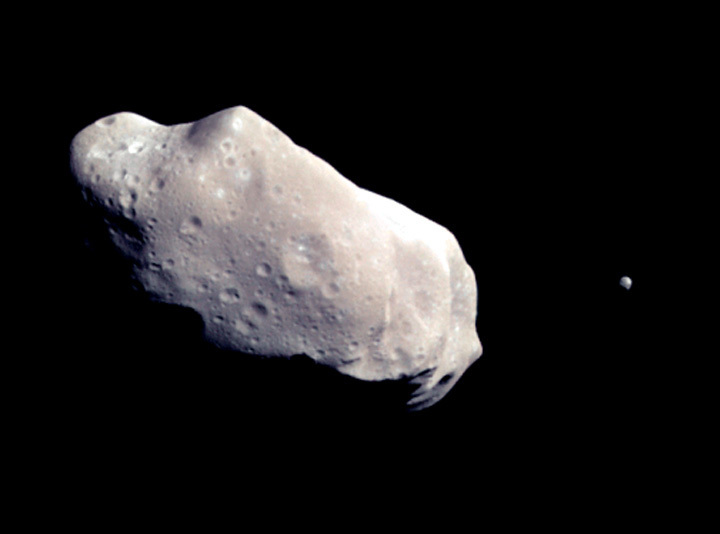 A handful of asteroids have been imaged at close range by spacecraft. 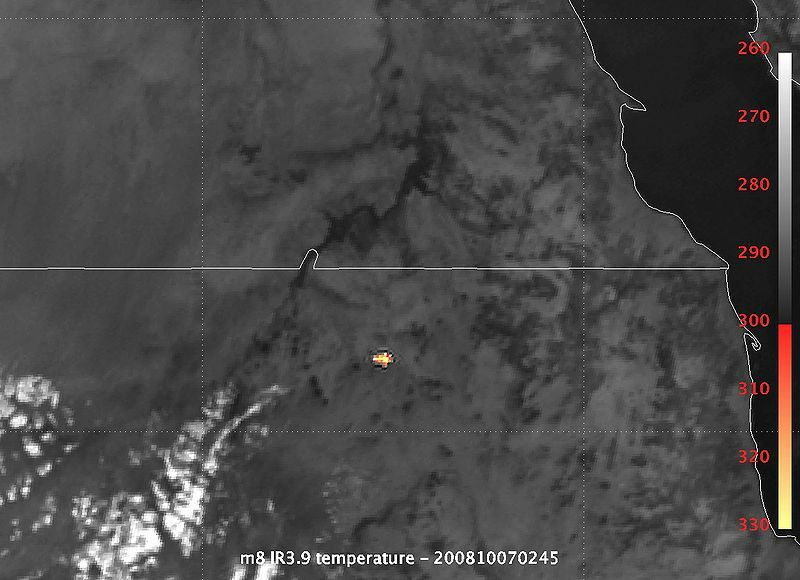 Here are 3 moderately large (10s to ~100 of km in size) such objects. 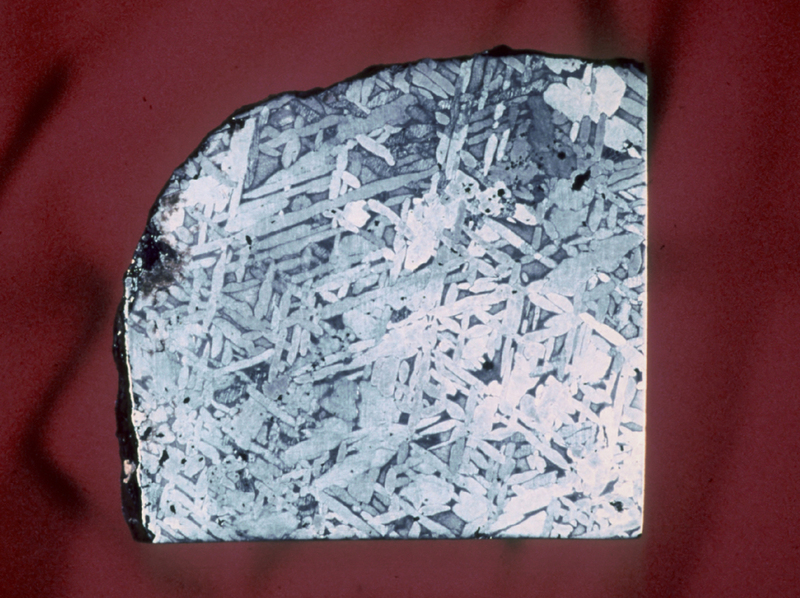 The majority are of rocky composition, while a small fraction are made of metal- mostly iron and nickel. The rocky asteroids are made of minerals that are common on the Earth. The vast majority of asteroids are made of silicate minerals- things like olivine, feldspars and pyroxenes. (Which may mean something to you if you took a geology class- otherwise, don't worry about it. The important thing is that they are same minerals as found on Earth.) 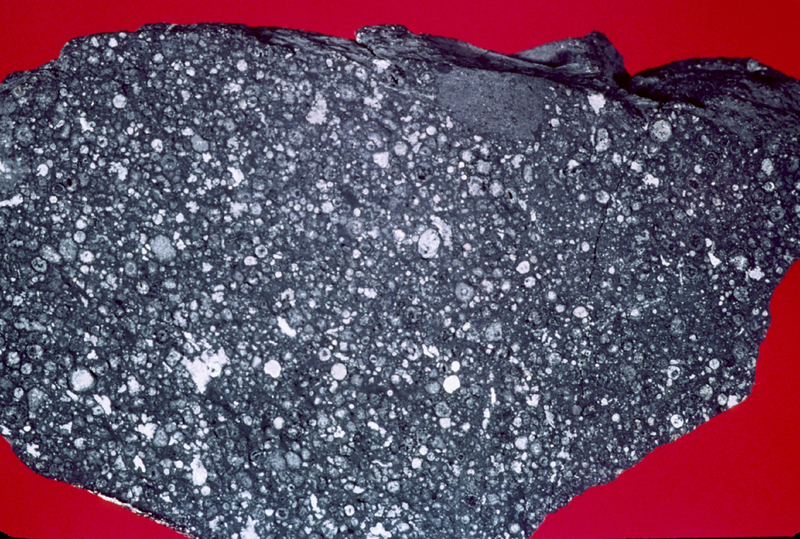 Some meteorites (and so presumably asteroids) contain chondrules, very ancient small bits of rock, which as previoulsy discussed, are of exterme importance as "time capsules" that we can use to probe the very beginning of our Solar System. 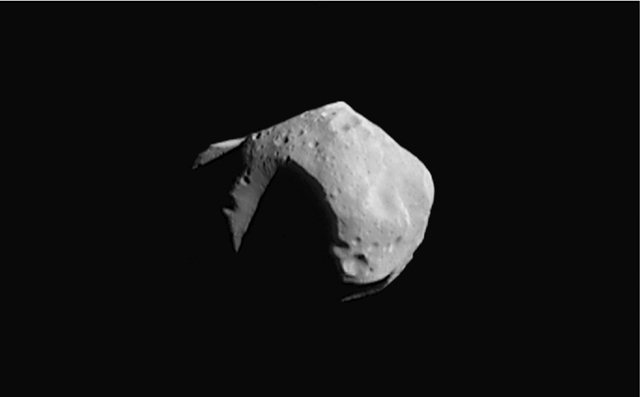 All the asteroids imaged appear patato-shaped and to have been battered by collisions and covered with craters. Chondritic meteorite This is a meteorite, a space rock that made it through the Earths atmosphere to land on the ground, here sliced open to reveal its internal makeup. 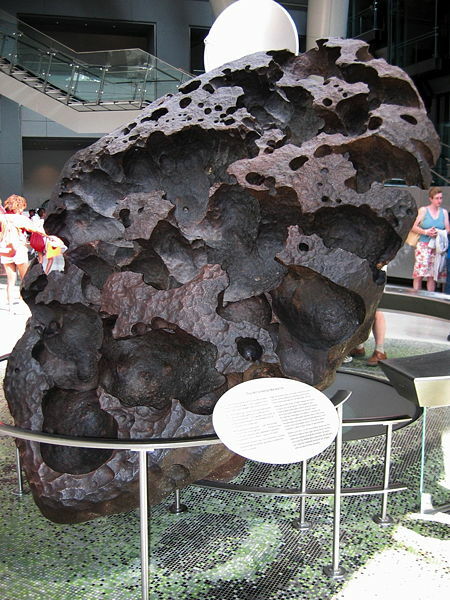 This type of meteorite has small, BB-sized chunks of rock called chondrites. Radioactive dating shows that these are 4.56 billion years old. These are the oldest rock particles known, and date back to the beginning of the solar system. Widmanstatten pattern Some meteorites are made almost entirely of iron and nickel. When these are cut open, and the surface polished and etched with acid, this pattern, called a Widmanstatten pattern, is seen. It is produced by slow cooling of iron. Willamette iron meteorite Willamette meteorite on display This large iron meteorite was discovered in Oregon in early 1900s. It weighs 15 tons. It is now on display at the American Museum of Natural History in New York City. Dawn spacecraft A NASA spacecraft is nearing the asteroid Vesta and will begin detailed study of this object this summer. 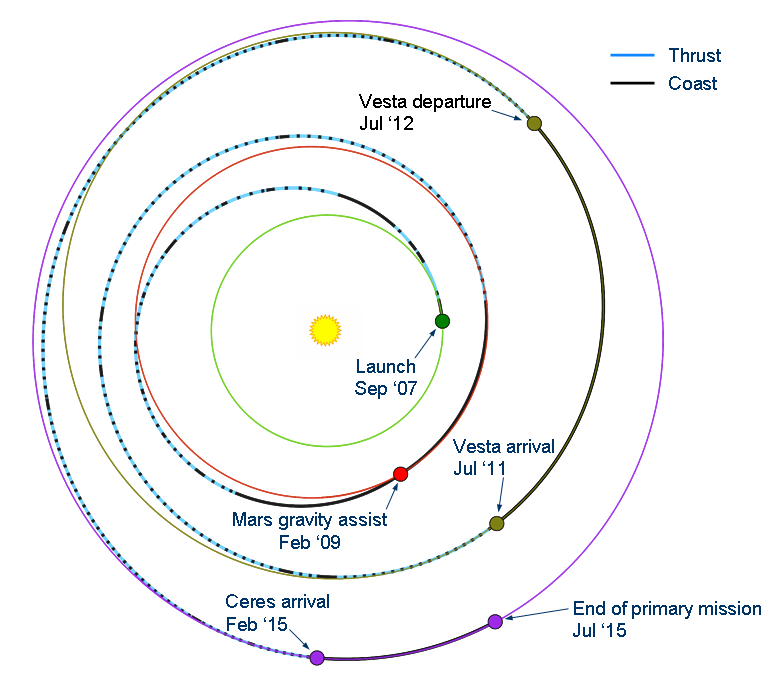 It will orbit around Vesta for about a year, then (if its still ticking!) scoot on over to asteroid/ dwarf planet Ceres , arriving in 2015. 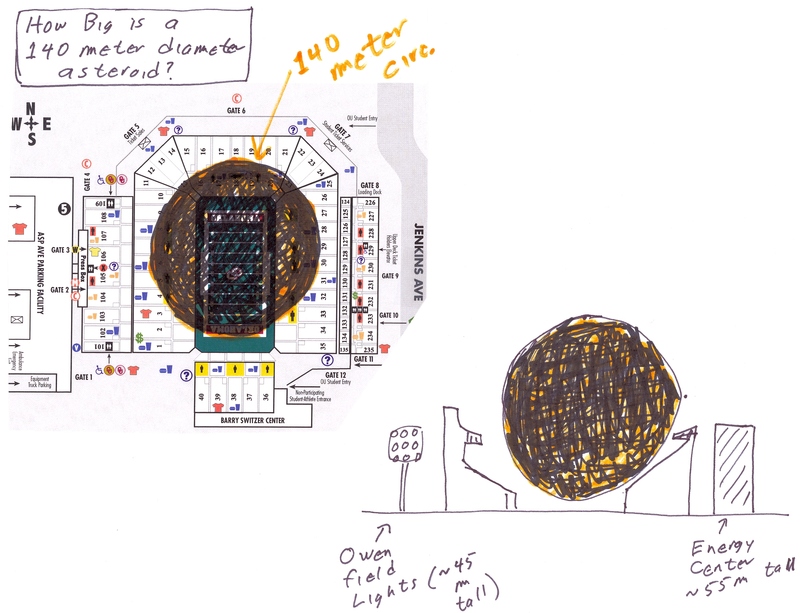 Sudan meteorite Astronomers are making big effort to discover and find the orbits of asteroids that may hit the Earth. This is a picture (taken from a weather satellite) of a Hummer-sized asteroid hitting the atmosphere of the Earth over the Sudan a few years ago. The next picture shows an astronomer and fragments of the rock (it broke into many little pieces) as it was found in the Sudanese desert. This event was the FIRST time astronomers had tracked a rock in space and predicted it would hit the Earth. 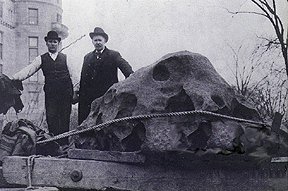 The rock was found only about 20 hours before impact. We hope that we would get more warning time for bigger rocks! Finding fresh pieces of an asteroid. 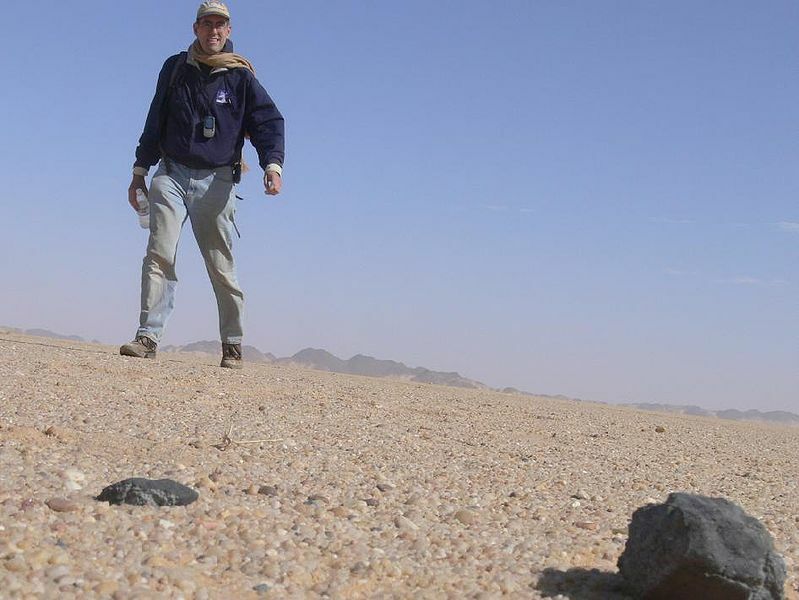 An astronomer finds a piece of the freshly fallen Sudan meteorite in the Nubian Desert.